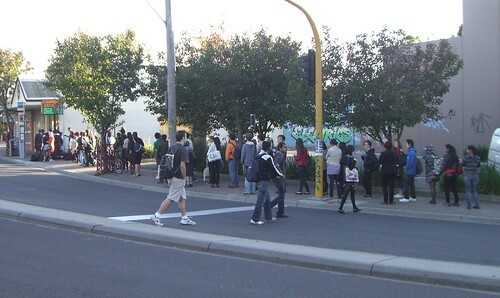 Chaos at Huntingdale station for students and staff waiting for buses to Monash University’s Clayton campus have led the Public Transport Users Association (PTUA) to renew calls for the Rowville rail line. PTUA President Daniel Bowen said that despite the addition of the 900 Smartbus to the route in 2006, and additional services on route 630, the buses were so snowed-under that Monash University had taken the unprecedented step of funding extra bus services themselves. “The queues for the buses are horrendously long, with services leaving people behind on the kerb. What’s worse is that passengers have to choose to wait at one of two bus stops, which for unknown reasons have been placed around the corner from each other”, said Mr Bowen. “Overcrowding on these buses in peak hour, and long connection times outside peak hours, have been a problem for decades. It’s simply ludicrous that the government has been unable to fix this problem, and that the University has to provide extra buses themselves. Mr Bowen said that in the longer term the long-proposed Rowville rail line should be built. The line was first proposed in 1969 to link Monash University to the rail network, and would also provide quick access to Melbourne’s city and inner-suburbs for residents of Waverley Park, Mulgrave, Wheelers Hill and Rowville. “The buses clearly aren’t coping, and the problem is getting worse. It’s time the government offered real transport solutions to Monash University and the Rowville corridor”, concluded Mr Bowen. Monash University announced on March 15th 2010 that “students and staff have experienced significant delays in the morning at the Huntingdale Station waiting for buses at the station to take them to the Clayton campus” and that as a result “the University will also be providing a free shuttle bus service from the station to campus from 7.45 am to 9.45 am (Monday to Thursday)”. Routes 900 and 630 combined provide 10-12 buses per hour between 7am and 9am. Extra buses have been provided beginning the week of Monday April 12th, but the University is continuing to provide its extra shuttle service Monday to Thursday to cope with crowds. Monash University Clayton campus has around 26,000 students (Source), with around 86% of those fulltime (and about 1000 living on-campus). Huntingdale is the main rail connection for students and staff coming from the city and inner-suburbs. Services packed while seven trains sit idle – where is the new timetable?